Follow in the footsteps of thousands of prospective gold miners between the long-abandoned towns of Dyea in Alaska and Bennett in Canada's Yukon, crossing the international border at dramatic Chilkoot Pass. 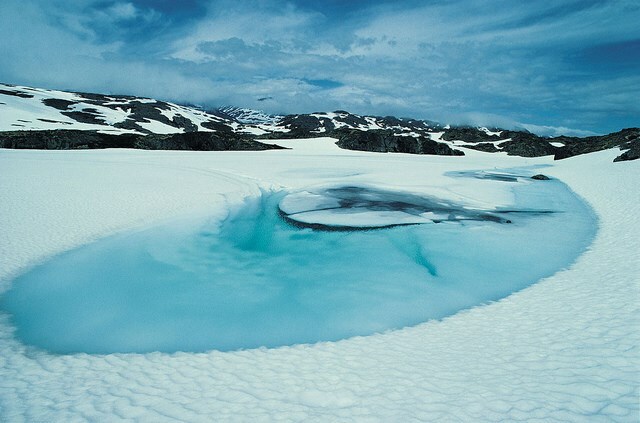 Trek through vast landscapes with an incessant covering of low-lying, rain-heavy clouds; the slopes, forests, lakes and rivers blanketed in thick, unstable snow through winter and spring. This is a very tough walk in high, remote mountains, on which you will have to be self-sufficient and where there are numerous dangers. Weather is extreme and unpredictable; avalanches are possible, and a significant risk especially early in the season. Bears wander the trails. Come prepared. Note: Negs: likely bad weather, including mist at pass; mosquitos; heavy loads to carry. 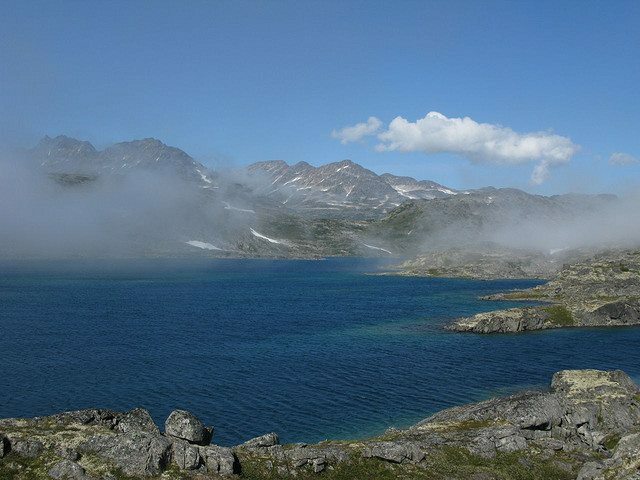 The Chilkoot Trail begins in the ghost town of Dyea, on the coast of Alaska, and follows the first thirty three miles of the long trek into the Klondike gold fields. In the 1890s, the stampede to Klondike's gold drew tens of thousands of men and women on the difficult journey through Alaska and into Canada, many of them taking the shortest, but hardest, route along the Chilkoot Trail. Falling into disuse following the slowdown of the Gold Rush and the construction of the narrow gauge railway directly to Whitehorse in 1900, the Chilkoot is now a national heritage trail celebrated almost as much for the enormous scale of its stunning landscapes as for its fascinating past. 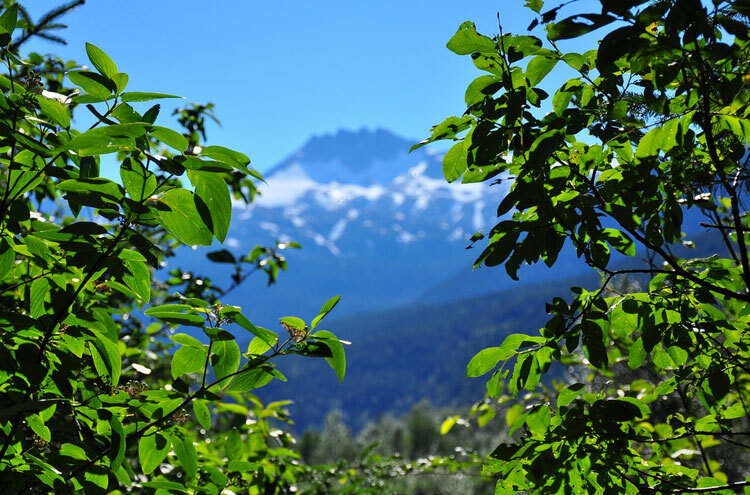 Skagway, once known as the gateway to the Klondike gold fields, is today still a bustling town, and a popular summer tourist destination (up to 8,000 people can pour off cruise ships on the busiest days of the year). Boomtowns have always bred corruption and criminality; here, the underworld was dominated by "Soapy" Smith, scourge of Colorado. Despite being turned away in 1897, by mid-1898 the US Marshall was on his payroll, his fake telegraph office was in full-swing, and his saloon had been dubbed "the real City Hall". Killed in a shoot-out on Skagway's Juneau Wharf, Smith is now venerated in festivals as well as popular media as a Robin Hood-style anti-hero, with his grave a popular stop on the tourist trail. But for those walking the Chilkoot Trail, it is the hardships and miseries of the miners exploited by Smith and his like which are striking. Once the news of gold in the Yukon had filtered to the outside world, a year after it had first been found, the stampede to the gold fields began. Over 100,000 men and women set out to make their fortune, and the population influx temporarily made Dawson City, at the confluence of the Klondike and Yukon rivers, the largest Canadian city west of Winnipeg. More than half of those who set out never made it: turning back, settling or dying en route. Some perished from cold and hunger; others drowned or were buried in avalanches. There were deaths through illness - some died after eating the rotting horsemeat of the thousands of horses who died in Dead Horse Gulch. Many simply disappeared. In attempts to lower the death toll, the Canadian authorities put in place fierce stipulations: no boats could be launched at Bennett without proven expertise in boat building and handling, and potential miners must arrive with at least a year's supply of food. Combined with equipment, this left the Klondike prospectors carrying goods weighing a total of around one ton. On the last flat ledge before the steep ascent to the Chilkoot Pass, famously known as "The Scales", officials waited to ensure the rules had been followed. Entrepreneurs abounded on the routes to Klondike. Rather than continue to the gold fields, many set up hotels, restaurants, tramways, bridges and any other scheme which could eke cash from the hopeful prospectors. Some carved steps into the snow and ice, providing a passage to the pass, and charged a daily toll. Others charged extortionate rates to help carry supplies up the gruelling "Golden Steps" to Chilkoot Pass, with the going rate reaching US$1 a lb. Famously, Donald Trump's grandfather made his fortune running a hotel in Bennett. Of those miners that did brave the arduous journey to arrive, envisioning scooping gold from the ground and into their pockets, the majority were to be disappointed. Most were simply too late. By the end of 1898, most of the claims had been taken, and there were no more fortunes to be made. Even those lucky few who did snag a claim met disillusionment: far from scooping up their riches, they would have to spend weeks burning through the permafrost to delve deeply, and sometimes fruitlessly, below the ground. It was not just amongst prospectors that lives were changed in the Klondike Gold Rush. The Chilkoot Pass had been a carefully guarded trading route of the native Tlingit people, and the influx of migrants was to have an incalculable impact on them and their way of life. Many worked carrying goods over the pass, and made significant amounts of money doing so. However, as usual, white people meant disease, alcohol, and discrimination. Gold rushes are often lauded as the fulfilment of dreams - the chance for the adventurous and hardworking to be rewarded with fortunes in precious metal. And yet the human cost can be phenomenal. 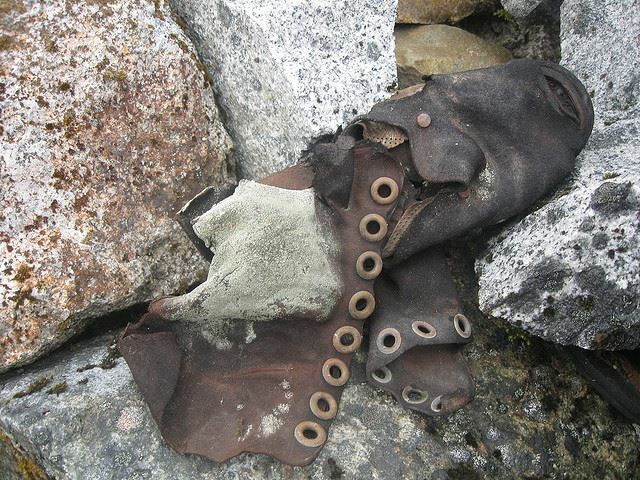 Those that walk the Chilkoot Trail cannot help but delve into the experience, the excitement and the hardships that faced their late nineteenth century counterparts. Historical artefacts dot the trail, from a piano to still-intact shoes, atmospheric reminders of the thousands who passed along here in search of a new life. Many traces of this history are vanishing before us: once a bustling, crowded settlement at the head of a long, narrow fjord, all that now remains of the 1890s town of Dyea is a single wooden wall, and a short stretch of fence. 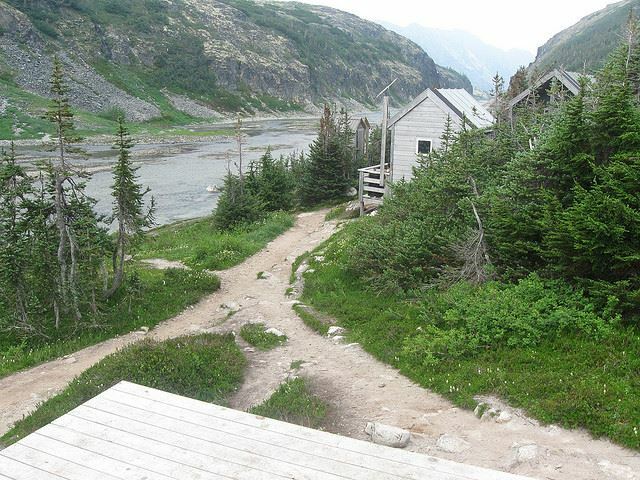 It is from this abandoned outpost that the Chilkoot Trail begins, on a section which can only be summarized as wet. 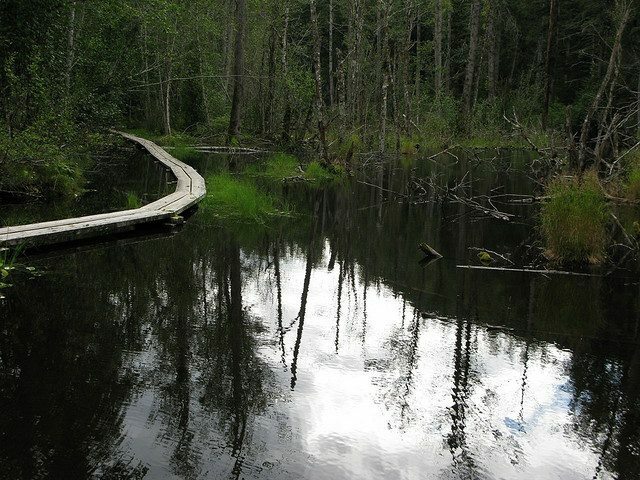 Making your way through damp, dripping coastal rainforest; you will cross over creeks and streams - any of the creeks are traversed by plank or rope bridges - and past burbling waterfalls. Finnegan's Point, reached just 5km or so into the walk, is the ideal stopping point for those setting out late in the day (although mosquitos are a major problem here: they can be unpleasant, particularly at dawn and dusk, throughout). On the flat ground beside the rushing Taiya river, you can look up at a steep slab of mountainside, waterfalls trickling from a high glacier. Walkers on a relaxed schedule often stop slightly further along, at Canyon City Camp, whilst those trying to complete the trail in three days can keep going to Sheep Camp, at the foot of the Golden Steps. The section from Canyon City Camp includes a possible detour to the ruins of Canyon City itself, although there is not a huge amount to see. The most significant artefact is perhaps the rusting tramway tank, once part of one of the three aerial tramways that ran over Chilkoot Pass. 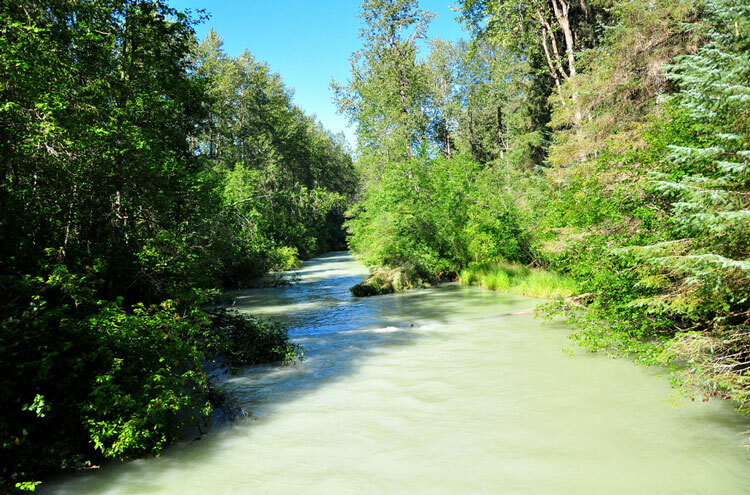 As the river disappears into the eponymous canyon, the trail heads away and up the side of the forested valley, before joining the Taiya again at Pleasant Camp. The stretch in-between was known as one of the worst for stampeders - primarily because the sheer volume of people churned the path into a mud-bath - but from Pleasant Camp it steadies out into some fairly straightforward, flat walking as far as Sheep Camp. 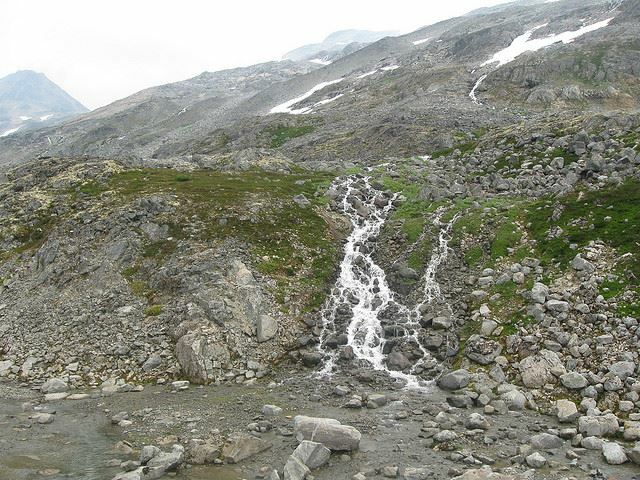 Most Chilkoot Trail hikers spend a night here. 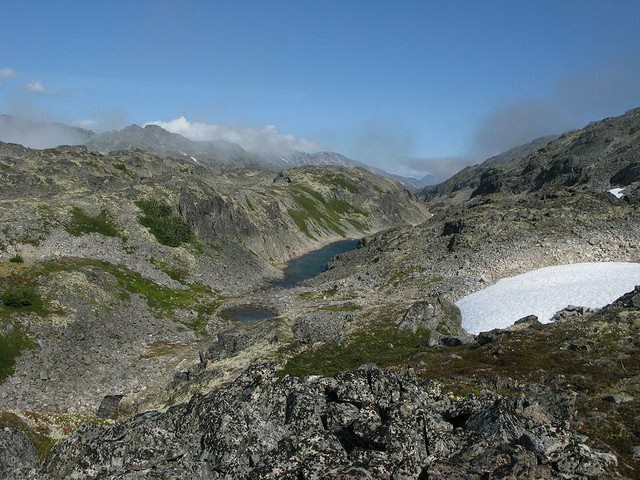 The last campground before the steep ascent to the Chilkoot Pass (and the last in the US), Sheep Camp provides an ideal base for the difficult slog through the avalanche danger zone and over the trail's highest point. Coming from any further away, walkers are unlikely to complete the next stage in one day - rangers recommend leaving 7.5-10 hours for the trek to Happy Camp. 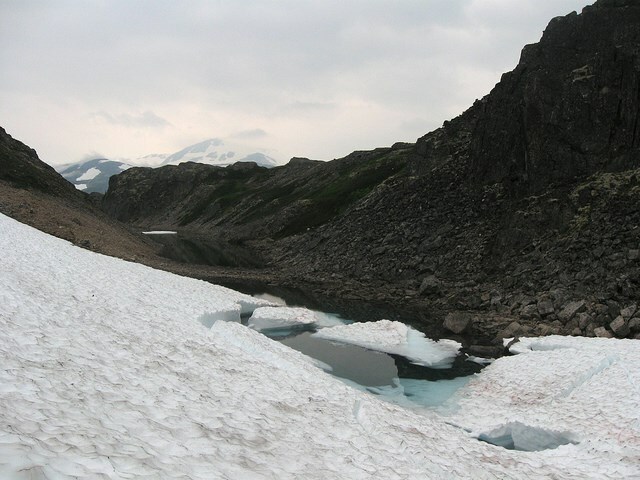 Chilkoot Pass has an elevation gain of nearly 800m in just over 5km, and it was at the foot of the "Golden Steps" carved into its icy slopes which many would-be prospectors turned back. Faced with the daunting task of lugging a ton of goods up the incline (a task that could take 40-50 trips) they abandoned their belongings, leaving one of the richest sites for artefacts on the trail. 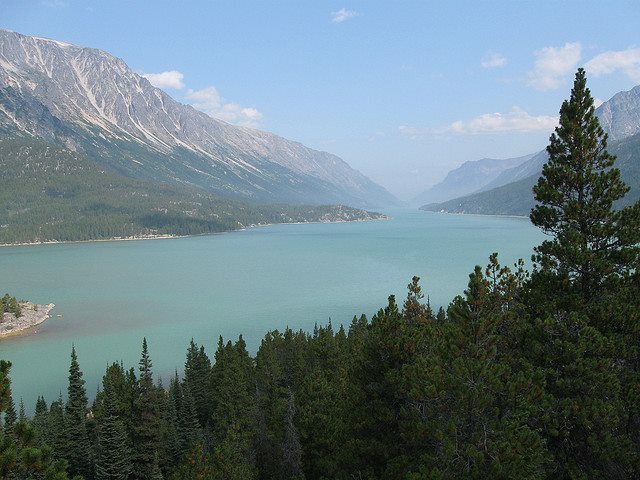 This area was known as "the Scales", as it was here that the authorities weighed the stampeders' belongings, ascertaining they had the required volume of food and other items necessary for survival in the Yukon. There is now no ice staircase or overhead tramway, only a lonely tramp over the rocky, freezing summit. Conditions are often bad, and low-lying cloud can make for an eerie backdrop, leaving walkers with the impression that they are perched on a desolate precipice. The warm Parks Canada ranger cabin at the US/Canada border provides a welcome respite. 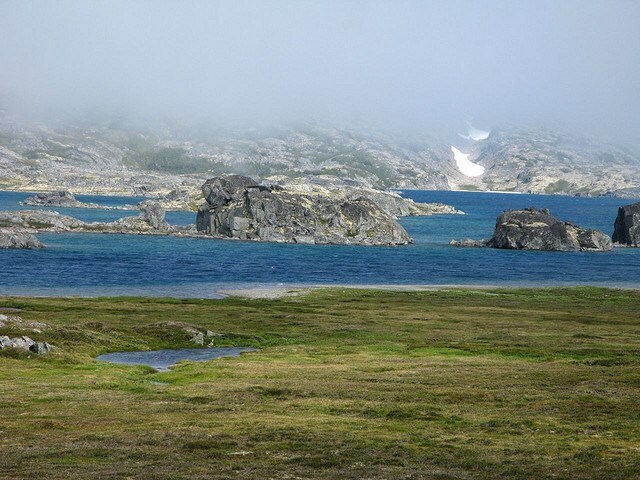 Happy Camp, named for the relief of prospectors as they arrived, is reached after a trek through the exposed alpine landscape beyond Chilkoot Pass, and sits between scattered lakes. 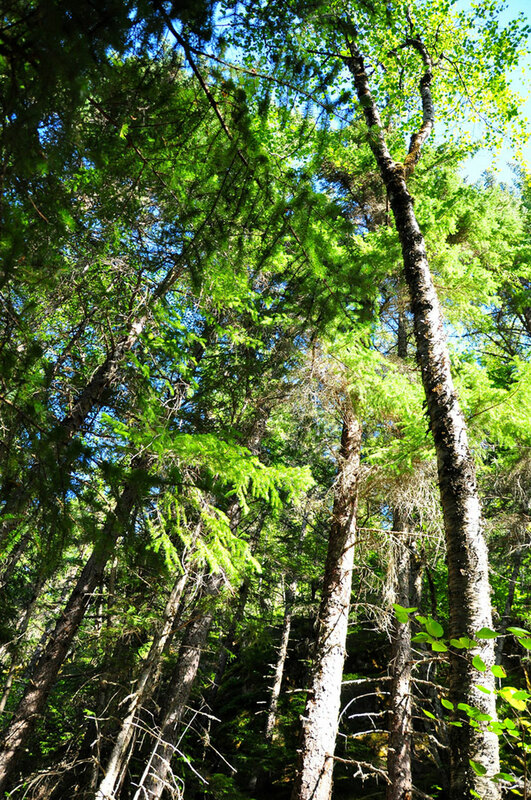 Further on, as trees begin to fill the scenery once more, the climatic difference on the Canadian side becomes more noticeable - forests of dry pine dominate, rather than the lush, temperate rainforest previously seen. 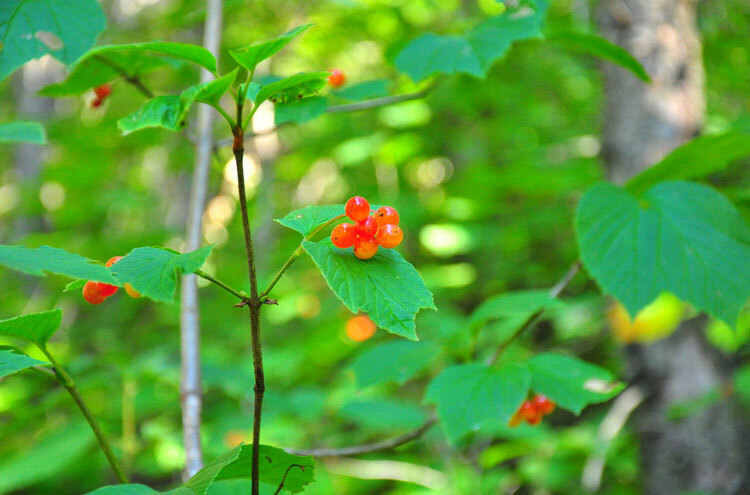 From Happy Camp, walkers can take a more leisurely pace again. 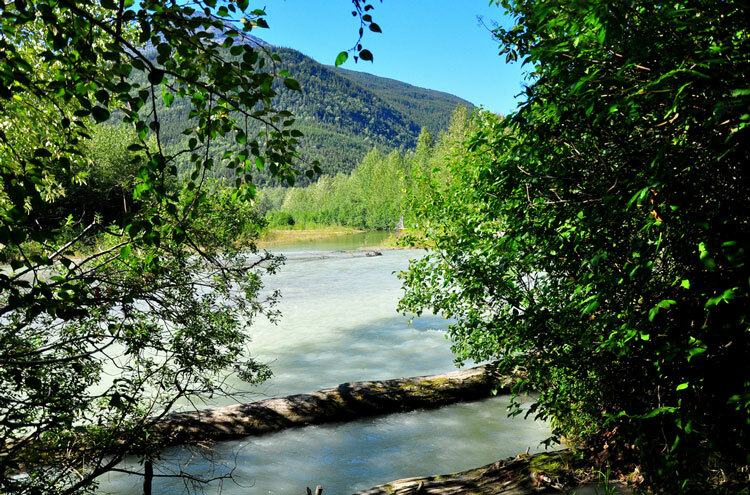 Beautiful lakes are dotted alongside the trail all the way to Lake Bennett; Lake Lindeman in particular is worth taking some time to explore, with its splendid turquoise waters and historical associations (fleets of boats, many built by amateurs, were launched from its shores). 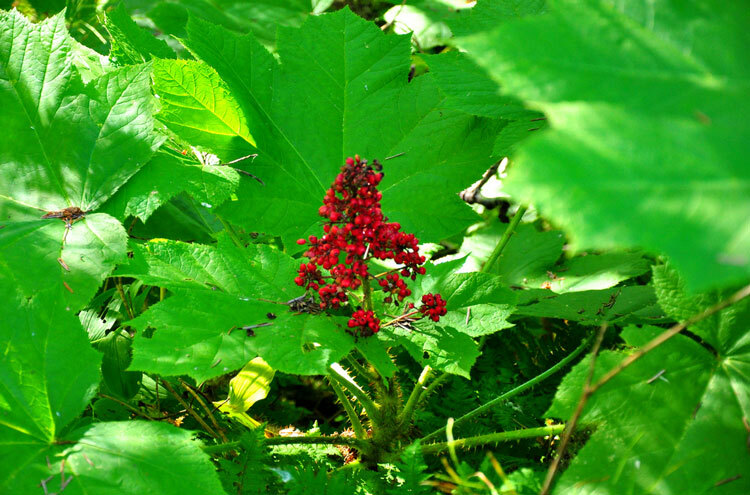 The campgrounds at Deep Lake and Bare Loon Lake are particularly scenic - some of the most beautiful spots on the trail - whilst the camp at Lindeman is overflowing with fascinating traces of the prospectors. 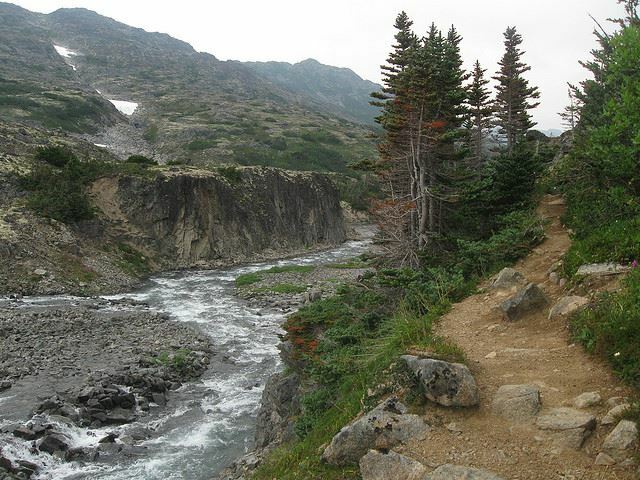 At Bennett, the trail comes to an end and hikers can meet trains heading towards Whitehorse (capital of the Yukon) or back to Skagway, on the White Pass and Yukon Route railroad. Trains do not run all year round, so do make sure you check if you're travelling at either end of the season. 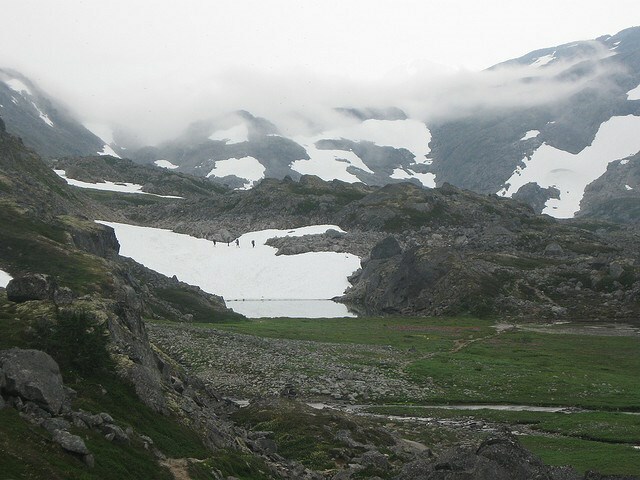 The Chilkoot is not a novice trail, and walkers should have a reasonable level of fitness and experience. You will have to carry heavy loads for what can be long days. 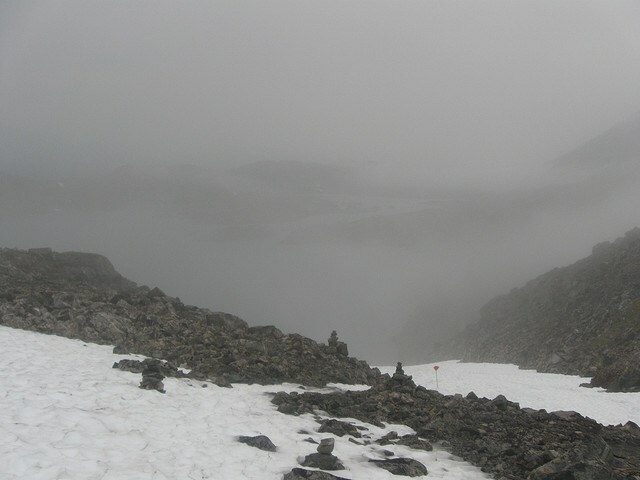 Frequent fog and rain make trail-finding difficult; and daily rain requires good clothing and equipment. There is a recovery service if you get stuck or lost, but a rescue could end up costing you thousands of dollars. Between Sheep Camp and Happy Camp in particular, walkers will travel through numerous avalanche zones, which are particularly active in the early season and remain so throughout the summer. You will need avalanche awareness and the necessary equipment (including a beacon, a shovel and a probe). Bears are common throughout much of the trail, and are often encountered. Take all sensible precautions. Walkopedia says: thank you so much, Charles. This is superb, we'd be proud to have written it ourselves! Looks fascinating, and a very helpful resource for our community.